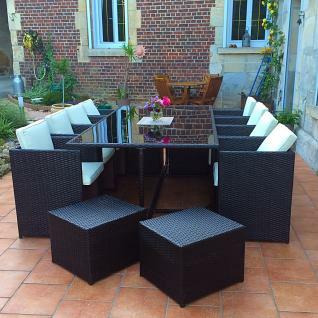 The modern, practical and aesthetically pleasing Vasto set can accommodate up to 12 guests. It offers an ideal storage solution. When you are not using them, the footstools interlock under the chairs, which in turn are stored under the table. The Vasto e is also comfortable. Its cushions are thick and its armrests and backrests are 3cm wide. To move and store the chairs easily, all the backrests have a handle. 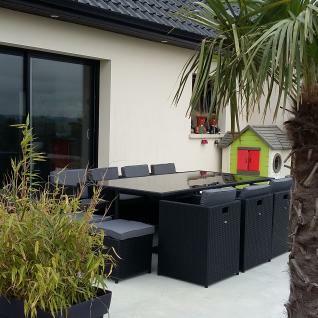 The Vasto is made from polyrattan and is extremely sturdy. This chic, modern material is designed to resist UV rays and poor weather (rain, snow, salt water). To guarantee the longevity of this set, its galvanised steel frame is powder coated and thermo lacquered. This treatment offers greater protection against rust. The cushions (6cm) have removable covers and are water--resistant. They can withstand small splashes and drizzle, however we recommend storing them inside when it is raining.They are also adorned with piping. The table top is made from 5mm-thick black toughened glass. This is 5 times stronger than traditional glass. 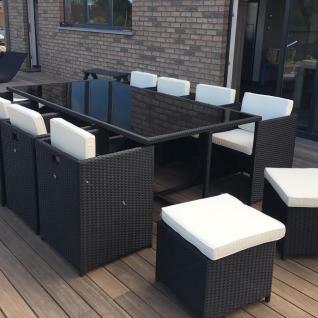 12 pieces; 8 chairs, 4 stools with cushions,1 table with glass top. Assembly: The feet are disassembled for transport. You will simply have to reassemble the set with the tools provided, in order to enjoy it as quickly as possible.